This year’s Fleet 10 Cruise was organized by Alice. The itinerary for the week-long cruise was suggested near the end of last year’s cruise, and discussed at our fleet’s Holiday Party. The cruise revisited the destinations of the first Fleet 10 Cruise that was held 20 years ago. 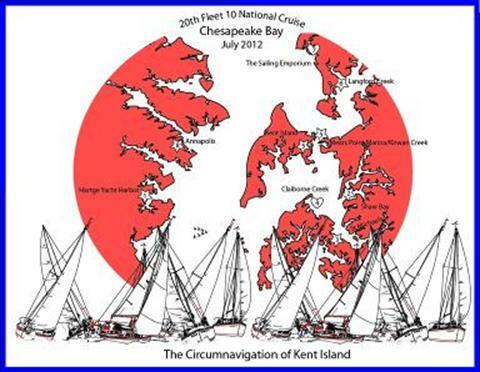 It was a middle Chesapeake Bay cruise that circumnavigated Kent Island. For Alice and me, the cruise started on Thursday, July 5th, at Maryland Marina, where we reassembled our son’s Catalina 22, First Draught. We had trailered his boat home from his single-handed “NYC to Canada cruise”, less than a week earlier. On Thursday evening, we sailed our boats 15.5 miles to Bodkin Creek, off the Patapsco River. We anchored our boat, WoodWind, in the dark and First Draught rafted to us. On Friday morning, we met two of our newer Fleet 10 members, Pete and Cindy, whose marina was nearby. 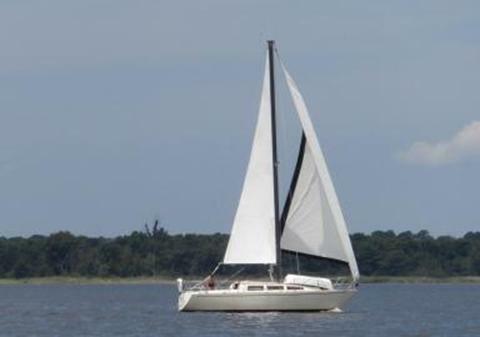 Pete and Cindy would be sailing their Catalina 22, Liberty Pass, on their first cruise with us. 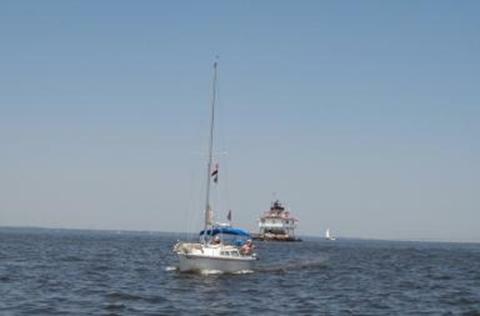 We sailed the three boats out of the Patapsco River, but soon ran out of wind, and motored past Annapolis and Thomas Point Lighthouse, on our way south to the Rhode River. 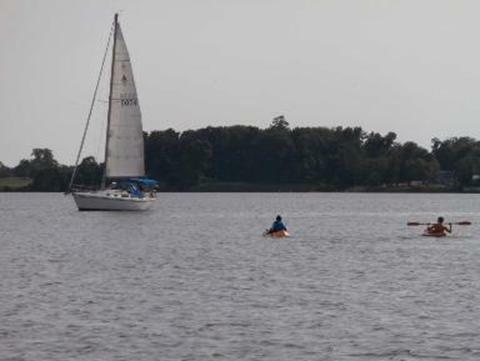 We anchored at a cove on the Rhode River, and were soon part of a six boat raft. (This was the result of a short e-mail message from Loretta on Energy). Soon after we anchored, we noticed that there was another Catalina 22 anchored nearby. We realized that it was Sweethaven, with our friends, Tony and Kim, aboard. They soon pulled-up their anchor and joined our raft, along with Phil and Josh on Schatzi, who had just sailed into the river. The pre-cruise party started, and we began snacking and swimming in the water. It was very hot. We did notice that there were a few sea nettles, (jellyfish), in the water, but continued to swim, and watch out for the nettles. I had never been stung before, but that was about to change. I noticed that I had been stung around the waist. I then climbed out of the water and peeled the sea nettle’s tentacles from around my waist and back. I had red stripes all around me. Loretta brought some meat tenderizer from her boat, and Cindy and Loretta put it onto my stripes. Cindy brought over a Piña Colada slushy, that I drank very quickly, since I was so hot. I soon couldn’t feel the sting from the jellyfish. Loretta said that the sting from a sea nettle only lasts about 4 hours, but I fell asleep before that. On Saturday morning, July 7th, we sailed around the point to Hartge Yacht Yard in Galesville, Maryland, for the official start of the cruise. It was another very hot day. I took three showers that day just to stay cool. They didn’t have a pool, which didn’t seem like a problem in February when we were planning the cruise and checking-out the marina. We had our opening picnic at Hartge’s, which was catered, and the food was fine. We were happy that Bill and Jeanne of Wanderer, and Dan and Grace of Wanderer III, were able to join us at the picnic, even though they were not able to sail with us on the cruise. We were also happy that Barbara came to the picnic while Ken sailed in on Whisper, after single- handing his boat from Solomons. The temperature on the thermometer inside our boat read 103 degrees. Alice and I slept with a fan running in our front hatch all night. The hot Opening Picnic at Hartge Yacht Yard. Augie IV cooling-off on a Slip ‘N Slide at the Opening Picnic. 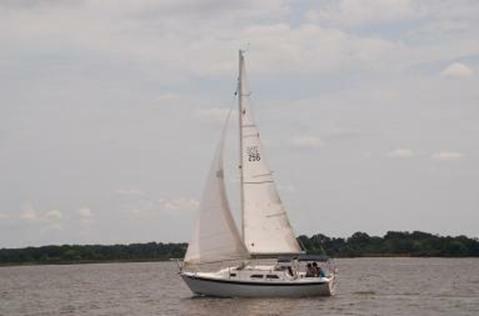 On Sunday, we sailed approximately 19 miles across the Chesapeake Bay and the up the Eastern Bay to anchor in Shaw Bay. The winds were a little light and we sailed then motored. We were very excited to hear Matt and Karen on Bellefonte Lady on the radio, and to hear that they were joining us after a boat problem had prevented them from meeting us on Saturday. At Shaw Bay, we rafted the boats together. Many rays were spotted in Shaw Bay. Our twelve boat raft with six Catalina 22s in Shaw Bay. 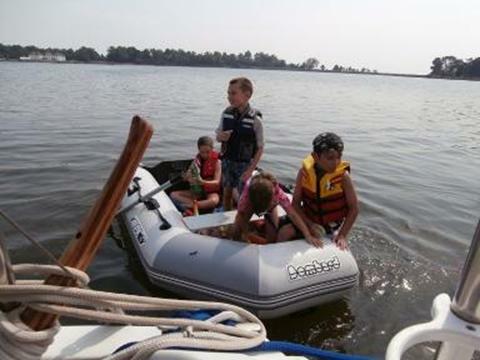 The children played in the dinghies. Ian taking charge of his dinghy. We separated the raft that night because the anchor line wrapped around one of the big boat’s rudders after the wind shifted due to nearby thunder storms. (It takes much longer for a big raft to spin around an anchor line, than a single boat at anchor). The thunderstorms broke the excessive heat. On Monday, we sailed in very light winds to St. Michaels on the Miles River, where Paladin with Chris, Conor, and Shaylyn joined us after their delay the day before because of motor problems. 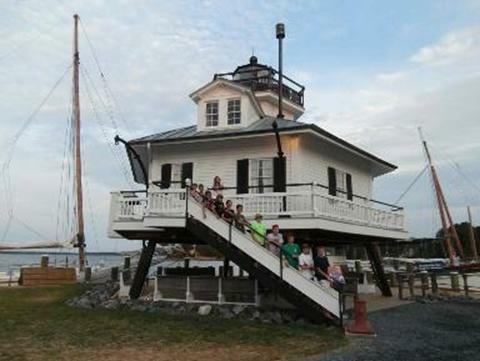 We stayed at the Chesapeake Bay Maritime Museum overnight. This was a pleasant surprise, since we had planned on anchoring near the town, but Lori and Loretta arranged for us to stay at the museum’s docks. Some of our fleet’s boats tied-up at the museum’s dock. 2012 Cruise photo at the Hooper Strait Lighthouse. You can see that there were 12 youngsters on this year’s cruise. 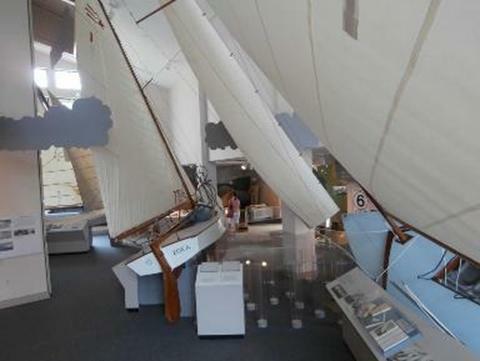 Some of the museum’s sailing exhibits. 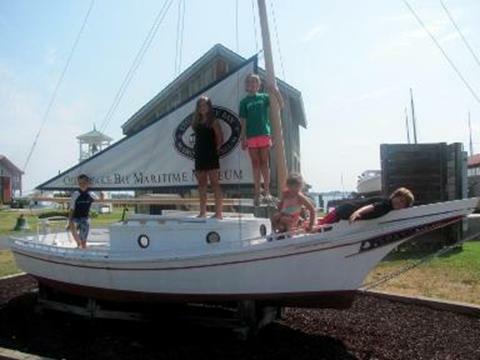 Some of our fleet’s kids posing at the museum. 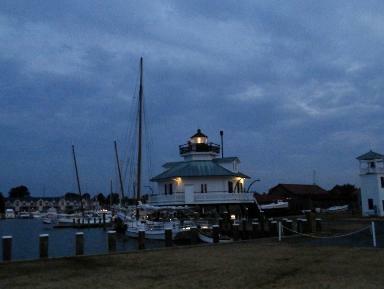 Sunset at the Chesapeake Bay Maritime Museum. Hooper Strait Lighthouse after dark at the museum. 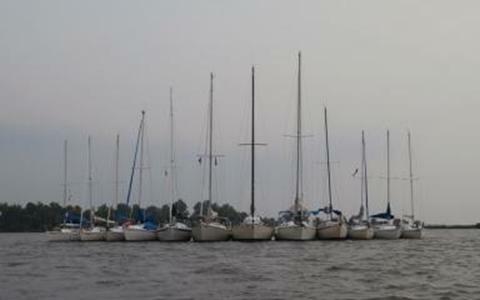 On Tuesday, we sailed the rest of the way up the Eastern Bay to Mears Point Marina. 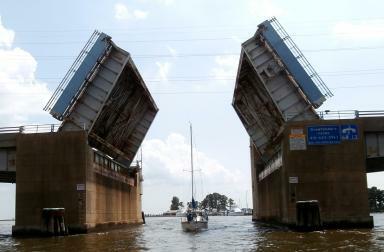 Bellefonte Lady, with Matt and Karen, going through the Kent Narrows drawbridge. The winds were again light and it was hot, so we started our engines. I could see that we were soon going to be ambushed by August Moon and Reflection, so I asked Alice to load our squirt guns, and get a bucket of extra water ready. We were badly outgunned by Augie IV, Louis, Nathan, and Sean, but there is always next year when we will be better armed. When we got to the marina, we enjoyed the big pool. It rained after our swim, so we took our umbrellas for a walk to the Harris Crab House, across the street from the marina. On Wednesday morning, Eric, Jennifer, and their children, Ian and Emily, aboard Mainstay, and Ken aboard Whisper, left us for their long trips home to the Potomac River. Missy and Rick, and Luke, Annabel, and Gianna aboard Anchovy, also had to head home. Ken leaving for home from Mears Point Marina. It is rare for us to get photos of Energy sailing, since they are usually far ahead of us, but on this leg of the cruise our three boats sailed close together in the light winds. 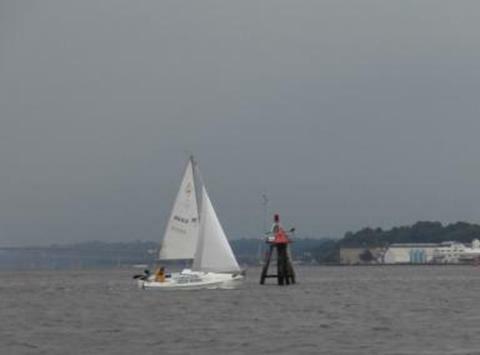 (Tom races his Catalina 22, Quixotic). 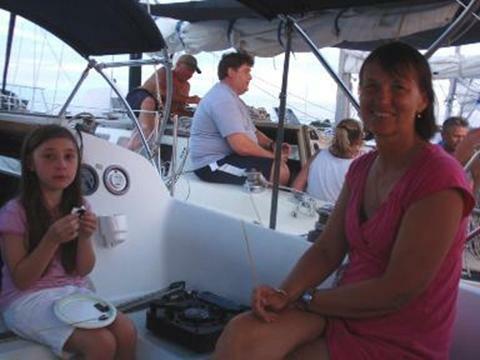 Here’s a photo that Tom took of Alice and me sailing Woodwind. Aldo and Alice sailing WoodWind. Kayaks welcoming August Moon to the raft on Langford Creek. After we were rafted together, we received a call on the VHF from Pete and Cindy on Liberty Pass. They said that the pintles had broken off of their non-kick-up rudder after hitting the bottom on some rocks. I told them to come to the raft and we would see what we could do. Danny and I used some long 3/8 inch diameter bolts that he had in his boat to make some temporary pintles. (Sometimes I think that he has a marine hardware store and machine shop in his boat). I carved some wooden wedges to wedge the bolts into the pintle straps that remained on Pete’s rudder. Phil had some rock climber’s cord that we stretched to make two purchases to pull the rudder down against the gudgeons, so that it wouldn’t fall off the shorter than desired bolts. This photo doesn’t really need a caption. 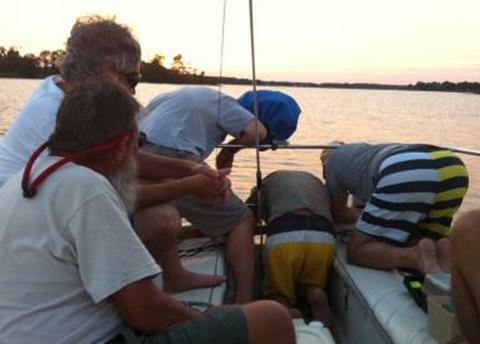 After we made the temporary fix to the rudder, six of us took the boat out to test sail it. This was one of the most memorable sails of the cruise for me. 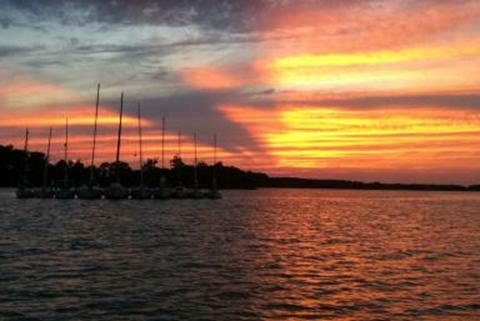 Pete, Cindy, Danny, Augie, Phil, and I sailed the boat as the sun set. 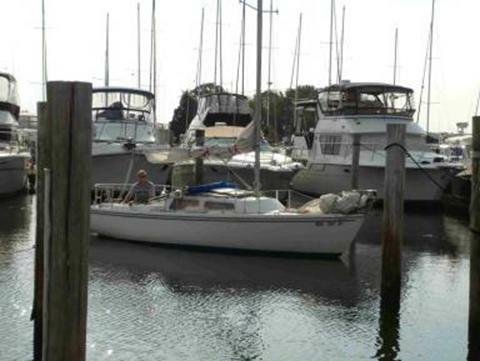 We wanted to test our fix, and I wanted Pete and Cindy to have confidence that it would be adequate to get them back to their marina safely. Augie took a turn at the tiller. He sails the Catalina 30, August Moon, and hadn’t sailed a Catalina 22 in many years. We took turns at the tiller and the jib sheets, and sailed until the sun went down, then sailed back to the raft. We reached a speed of 5 knots in the light cool evening air just before dark, even with six of us on the boat. Here’s a photo that Cindy took while we were sailing that evening. Cindy’s photo of our raft on Langford Creek. 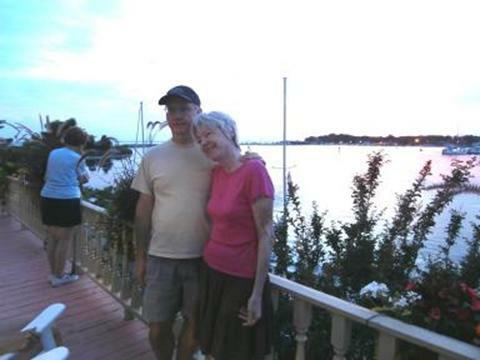 (Cindy framed this photo and gave it to us at the Fleet 10 Picnic, later in the summer). 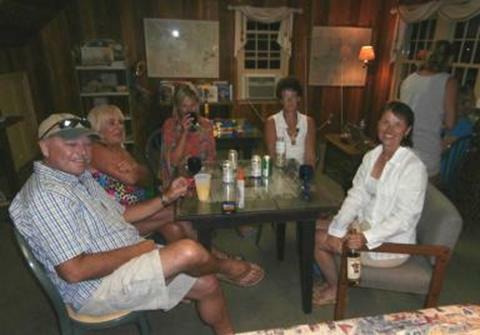 After we arrived back at the raft, we had shrimp risotto that Loretta had prepared for us. It was excellent as always. Heather and Carol on YES II were given 13 crabs by a waterman when we left St. Michaels. We teased them that it was because of their red lipstick. Loretta and Tom steamed and picked the crabs. Langford Creek is a beautiful anchorage. The kids got to use the kayaks, and it was a nice night for sleeping on the boats. Shaylyn and Carol eating s’mores on WoodWind. On Thursday, the fleet sailed slowly down the Chester River past Love Point then turned northward toward Rock Hall. 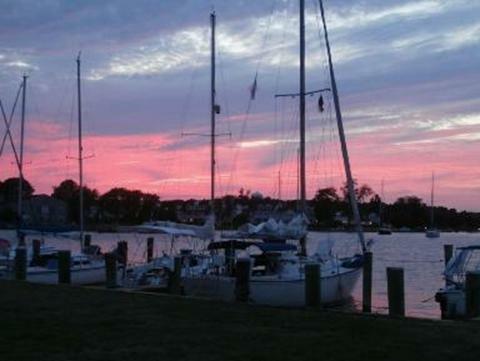 At Rock Hall we stayed at the Sailing Emporium, one of our fleet’s favorite marinas. We had a picnic there. 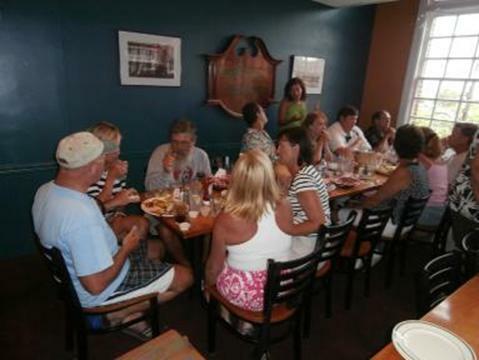 Fleet members, Richard and Pat, and Dan and Grace, who didn’t sail on this year’s cruise, also met us for the picnic. After dinner, we went up to the balcony and the meeting room that overlook the Sailing Emporium’s slips. Jim and Sean had to head home on Reflection. Richard and Pat on the balcony at the Sailing Emporium. Our party in the meeting room at the Sailing Emporium. 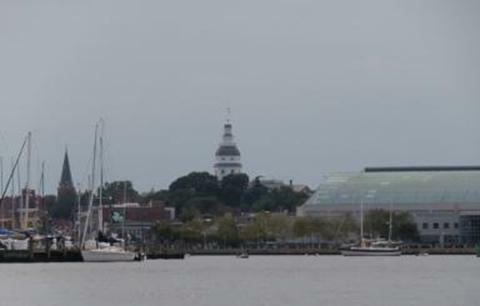 On Friday, we motored across the Bay to Annapolis. 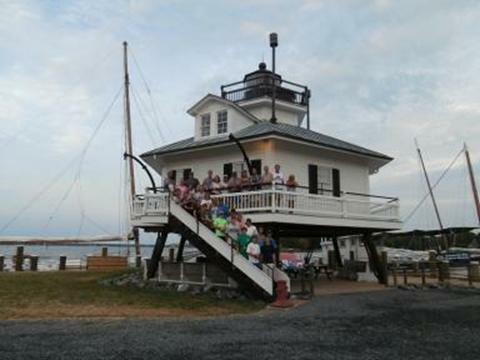 Many of us stayed at the Eastport Yacht Center on Back Creek of the Severn River for the night. We had dinner at Buddy’s Crabs and Ribs. We were given a back room, and it was great to get together one last time on this cruise. We met another Fleet 10 member, John Mueller, after dinner for a nice visit. Dinner at “Buddy’s Crabs and Ribs” in Annapolis. 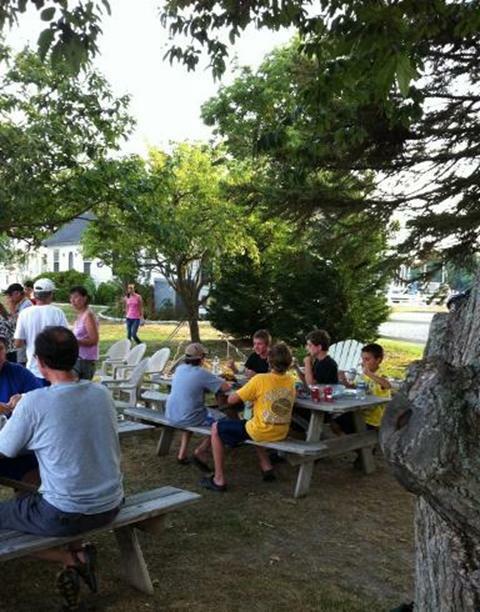 Later, some of us walked up the hill to get ice cream, before Lori took us to our marina for the night. On Saturday morning, First Draught, Yes II, and WoodWind motored out of Annapolis. The sky looked ugly, and as we motored around Greenbury Point, it started to rain. We could hear thunder as we crossed under the Bay Bridge. I wasn’t too excited about this, since our marina was still about 30 miles away, but Danny unfurled the sails of First Draught and started sailing. First Draught in the rain at Greenbury Point near Annapolis. We continued to motor WoodWind until the storm passed, and then had a nice sail most of the way to Middle River, before the wind died. There were fourteen boats that sailed on this year’s cruise, including seven Catalina 22s. The winds were light and there were times when it was very hot. My favorite memory from this cruise was actually the fixing and test sailing of Liberty Pass, after we made our temporary fix to the boat’s rudder. It was nice to share a Catalina 22, since we don’t usually get to sail together on other fleet member’s boats. Danny suggested that next year we put the Catalina 22s on the ends of the raft that we will take sailing in the evenings. Maybe we can even race them! It was a nice relaxing cruise with our Fleet 10 friends, old and new. Here’s the t-shirt artwork that Tony made for this year’s cruise. We are always excited to see his design, and this is now one of our favorites. Next year’s cruise will be a Southern Bay Cruise, tentatively planned to start in the lower Potomac River. 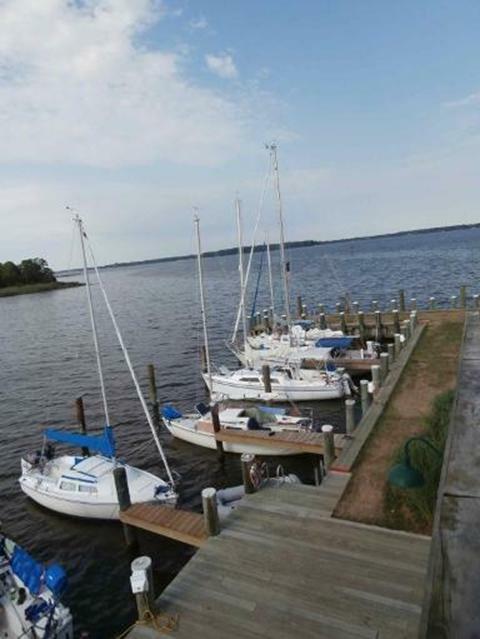 Tom wrote to me, “We are exploring a cruise to some of the waterfront cities and towns of the Northern Neck and Middle Peninsula of VA, including Deltaville, Irvington, Urbanna, Kilmarnock and Reedville, starting and ending in the lower Potomac River. Current cruise dates under consideration are Saturday June 29 through Saturday July 6, 2013.” We will continue to work on planning this ambitious cruise over the coming winter. If you think that you may want to sail with us on a future cruise, or if you have a question about Fleet 10, please send an e-mail message to us at: Captain@fleet10.org.